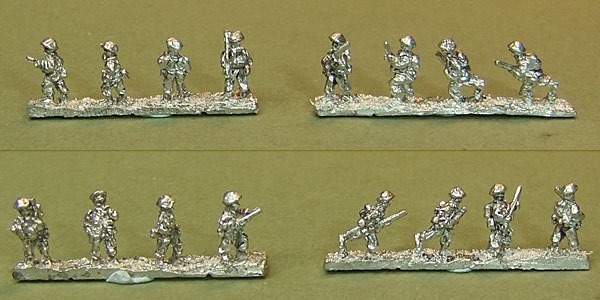 I was speaking to Pete Berry from Baccus 6mm at the Claymore wargames show last Saturday and he very kindly gave me a few samples from his forthcoming range of 6mm WWII British. These should be released later this year accompanied by full ranges of Americans and Germans, all suitable for fighting the 1944-45 campaign in North West Europe. You can see the unpainted models below. The detail is excellent and my painting doesn’t really do the models justice. To give you some idea of the size I’ve pictured the models here alongside some 6mm 8th Army troops from Heroics & Ros (Right) and some 10mm early war British from Pendraken (Left) As you can see the Baccus 6mm figures are considerably larger than the Heroics and Ros, which are nominally the same size. Here they are next to some Heroics & Ros Churchills and as you can see they’re not really compatible. It’s just as well that Baccus are planning a full range of tanks that will fit with the infantry. These are being designed using CAD software but the final models will be metal, with the moulds being created from 3D prints. These new vehicles will not be the same as the ones Baccus were taking round the show circuit in 2013. Prices are not yet finalised, though the way Pete was talking I’d expect something similar to Baccus’ recent WWI offerings which come in at 96 figures for £6.60. The tanks will be more expensive than Heroics & Ros, but probably cheaper than GHQ. The question is whether or not I’m going to replace some of my heroics and Ros figures with these. They are very nice, and there’s considerably more detail, so a company or two could be on the cards. If I was starting from scratch there would be no contest. Edited 6th August. Here’s some more comparison pictures showing how the Baccus models compare in size to Heroics & Ros. The Baccus models are on the left of the picture in every case. The tanks are Sherman Fireflies. Note that the Baccus tank is one of the early prototypes that were made using 3D printing in 2013 and you can really see the grain on the model. It is not one of the models that will be released, though it is probably a good indicator of what the size will be. The new vehicles will be metal, but the masters used to make the moulds will be 3D printed. Next story Crisis? What Crisis? It looks as though these may be compatible with GHQ figures, which are notoriously too large for their tanks, too. I wonder will the Baccus vehicles be over-size – it’s harder to fudge that with a vehicle, where you can take exact measurements to compare with the prototype. Pete was vague about exactly what scale the vehicles will be (all he would say was “6mm”, which is a size, not a scale), but he was quite clear that they would “fit with the infantry”. He also said they would not really be compatible with anything else currently available. As far as I am aware Peter has done his range of vehicles to be compatible with Baccus figures. That’s certainly what Pete told me. I measured the 2013 ones and they were about 1/250th scale compared to GHQ’s declared scale of 1/285th. It is what we have always done and it has worked well for us so far. When Baccus was first started in a time far, far away, there were howls of protest from the existing 6mm community because they did not fit in exactly with the ranges that were already out there.